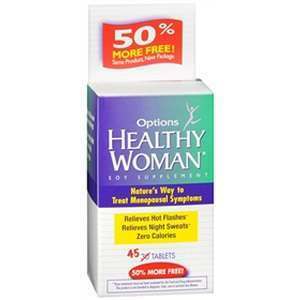 Options Healthy Woman Soy Menopause Supplement is made from natural ingredients. It contains OptiSoy, a unique soy extract formula, which delivers the required quantity of soy to the body in a single tablet and reduces symptoms of menopause like hot flashes and night sweats. This supplement contains zero calories. During menopause, as estrogen level drops, women start to lose bone density. Calcium prevents this and keeps bones and teeth healthy. The other ingredient is soy isoflavone. Isoflavones are plant hormones, which have similar effects like estrogen. When consumed, they adhere to estrogen receptors in the body and prevent the body from feeling too estrogen deprived. This also reduces the occurrence and intensity of menopause symptoms, which are mostly caused due to reduction in level of estrogen in the body. Recommended daily dosage is 1 tablet a day. The main active ingredient is soy and people who are allergic to soy should not use this supplement. A 45-tablet bottle costs $9.97, so the effective monthly cost is $6.65. This is quite low compared to other menopause supplements. The product is guaranteed by the company and by third party websites like Walgreens. A 30-day refund policy is offered on this product and if you are not fully satisfied, you can return the unused portion and claim a full refund including shipping cost. Is Options Healthy Woman Soy Menopause Worth Buying? This supplement contains only one active ingredient, soy, supported by calcium and so has a limited effect in controlling the symptoms of menopause. Jackie Horowitz	reviewed Options Healthy Woman	on June 20th	 and gave it a rating of 2.